Luka Doncic during Real Madrid victory in a Turkish Airlines Euroleague regular season game at Wizink Center. You may have forgotten about it altogether after being swept up by their playoff run, but the Sixers have a lot at stake in Tuesday's NBA Draft lottery. A jump in one form or another could be the difference between Philadelphia completing their core — no, for real this time — and handing one of their hated rivals the piece that could ensure their dominance of the East for years to come. No pressure, right? These are stakes that were determined across two different regimes and years worth of time, and the next decade of basketball can shift based on the bounce of a few ping pong balls on Tuesday. For the first time in a while, however, the Sixers will not be relying on the odds of their own pick to determine their future. Thanks to the trade from departed GM Sam Hinkie that sent point guard Michael Carter-Williams to the Milwaukee Bucks (and other parts elsewhere), the Sixers own the rights to the Los Angeles Lakers' draft selection this year. Those were unprotected up until last summer when current GM Bryan Colangelo offered up future assets in order to move up and select Markelle Fultz with the No. 1 pick. What was once unencumbered by protections is now subject to some pretty important ones. Let's run through a few of those real quick. Pick Odds Who owns the pick? If you're worried about the Celtics stealing another high-value pick, the above chart should calm your fears a little bit. There's only a 2.9% combined chance at Boston stealing the Lakers pick, thanks to L.A. finishing outside of the bottom six. With the 4-6 portion of the trade equation eliminated, there are only two scenarios in which the Sixers can lose their pick to the Celtics this year. Though that all but guarantees Philadelphia will have to sacrifice next year's Sacramento Kings pick — a juicy one, as they usually are — it will likely give the Sixers ammunition during a defining summer for the franchise. All the years of building have been leading up to this summer, where Philadelphia's basketball situation and cap space combine to make the Sixers one of the top free agent destinations in all the land. With a top-10 pick in hand and several young, talented players to use as trade chips, the Sixers would be locked and loaded in the event they wanted to make a splashy trade this summer. Kawhi Leonard looms on the horizon as the big fish there, even if the Spurs are showing no public signs of wanting to move on from their star wing player yet. ...the Sixers could be in a lot of trouble over the short and long-term. Boston stealing the pick through a lottery jump would not just offer their rival a chance at a premium talent in the draft, but alter the formula for potential trades the two parties can make this summer. The Celtics aren't in desperate need for major upgrades anywhere, with Kyrie Irving and Gordon Hayward expected to return at 100 percent to start next season. Between those two and Al Horford, the Celtics already have a trio in or around their respective primes to hold down the fort until Jaylen Brown and Jayson Tatum mature into the players they're meant to be. However, adding a potential big man of the future in DeAndre Ayton, Jaren Jackson Jr., or even Mo Bamba could potentially take the Celtics to another level over the long-term. Ayton is probably the most talented of the bunch and would be surrounded by players who can help him mitigate all his weaknesses on defense in Boston, and given the progress we've seen from less talented players under Brad Stevens, the thought of him heading there is fairly terrifying. Imagine a world in which the starting lineup featuring Aron Baynes was changed to include a dominant, athletic freak of nature in the post who can step out and hit jumpers and is borderline unguardable at his best. The other options would only solidify Boston's future as one of the best defensive teams in the league. Bamba is more potential than anything at this point, but Jackson was one of the most productive and switchable big men at the college level last season, and would fit almost perfectly into what the Celtics like to do. That's another defender the Celtics could use to make Ben Simmons' life miserable, on top of the damage he can do as a shot blocker with his length and recovery speed. This is assuming they wouldn't be interested in the guy who is likely at the top of Philadelphia's draft board: Luka Doncic, the playmaking sensation out of Slovenia. 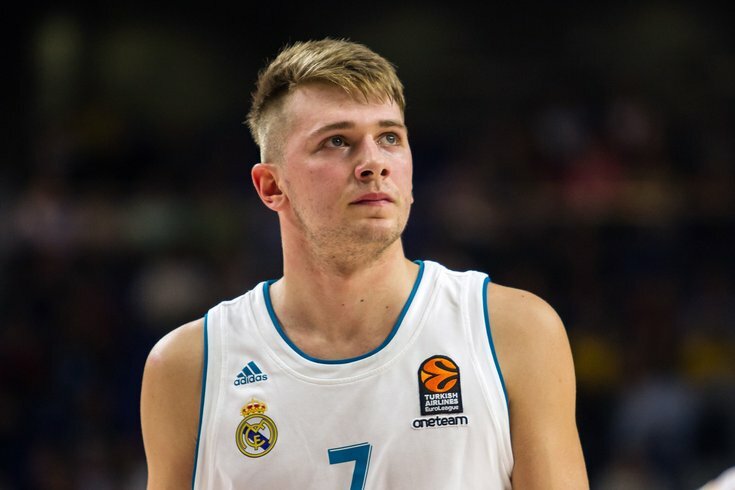 Doncic has turned into something of a folk hero for his exploits with Real Madrid and in international competition, and though he comes with question marks like any draft pick looks like the clear-cut name for Philadelphia to select should they have the good fortune of moving up to No. 1. With big men not really on the table for Philadelphia, Doncic makes all the sense in the world. He has arguably the best pedigree of any European prospect ever, having joined Madrid way back in 2015-16 when he became the club's youngest ever player to join at 16 years old. Doncic sees the floor and passes like a point guard, is built like a wing, and has a sterling reputation as a competitor. In many ways, Doncic would represent the counterpart to Simmons on offense the Sixers believed they were getting in Markelle Fultz. He has excelled as a pick-and-roll handler overseas, navigating through tight spaces while keeping options to pass and score alive simultaneously. His three-point numbers perhaps undersell his shooting ability — he shoots a fair amount of tough step-backs and is defended like a No. 1 option in Europe, which would not be as big a problem on a Sixers team with several big pieces around him. Doncic would afford the Sixers a level of offensive diversity they simply don't have right now, and would fit into almost any theoretical lineup the Sixers chase this summer. He can play off ball and catch-and-shoot, he can run the offense, he can score, he can set up teammates, and so on. The only concern awaiting him at the next level are questions about his athleticism compared to NBA athletes, but his level of skill and production is so high for a player his age in a top European league that most teams would be happy to move that to the backburner. The more likely scenario, obviously, is that none of these players or future concerns have to be planned for, and the Sixers will be selecting from a less star-studded group around No. 10. Though Villanova's Mikal Bridges emerged as a favorite for many when it became clear the Sixers would pick in that area, Philadelphia's playoff struggles on offense should underscore the need to have guys on the perimeter who can put the ball on the floor. Knockdown shooting is coveted for sure, but Philadelphia badly needs some offensive diversity to take the pressure off their two main cogs. But we'll get to Bridges and a ton of other young prospects if and when the chips fall for the Sixers in the lottery. With all this uncertainty, thankfully you don't have to guess when to tune in to watch the 2018 NBA Draft lottery. The lottery show starts at 7:30 p.m. Eastern on ESPN (and on corresponding streaming services), where they'll likely stretch this out into a half-hour program for the viewers at home. Once the drawing starts, fans who have tuned in in years past know what you're looking for — the Sixers logo popping up where it's supposed to. If you see the red, white, and blue of Philadelphia when the NBA flashes the No. 10 card, nothing crazy has happened and everyone can start planning for what that pick should get turned into this summer. There's a strong case to be made for them to use it as a trade chip, given the relative talent expected to be available, but that's an argument we have over a month to make. If the Sixers don't pop up in any of the spots from 10-13, that means you're going to have to sit through a commercial break in order to learn their fate. The NBA cuts away before they reveal the order of the top-three teams, which sets up a dramatic conclusion for anybody left standing. As we've already laid out, things would really rachet up for Philadelphia in this scenario — if the pick conveys at No. 2 or No. 3, the mood in Philadelphia will quickly turn from jubilant to crestfallen. Former No. 1 overall pick Elton Brand will represent the Sixers at the draft lottery on Tuesday, so we'll have to wait and see just how much good juju he brings to the table. ...well, needless to say that wouldn't be the best result if the Sixers want to lure LeBron James.